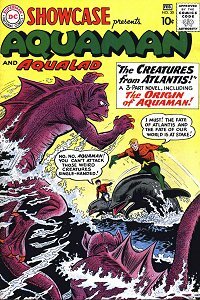 Showcase #30 (Jan 1961) - The Creatures from Atlantis! A distress call from Atlantis sends Aquaman back to his mother's home to stop an alien invasion. Aqua-Exclamations: Great Guppies! Shades of Davy Jones! Great Neptune! Great Waves! Sweet Seaweed! Leaping Sea Lions! Captured/Knocked Out report: Aquaman is captured as soon as he approaches Atlantis. Later, he's spotted spying on the leader of the aliens, and thrown in solitary so he can't warn the Atlanteans. Quotefile: Atlantean, "Farewell, Aquaman and Aqualad! Henceforth, we shall look upon you both as our ambassadors to the outside world!" Chapter One: Aquaman and Aqualad are riding porpoises when they spot the cargo ship on fire. Whales use their spouts as firehoses, swordfish cut open the hull so octopi can get at the poison cargo and load it onto the whales' backs. Eels form ropes to hold the cargo steady while Aqualad guides the flotilla to port. A lantern fish brings the S.O.S. from Atlantis, he orders the lantern fish to tell Aqualad where he's gone. Chapter Two: After his capture, Aquaman gets a guppy to relay his message to the outside, where it goes from a lantern fish to mantas to swordfish that tap out a message massing Aquaman's fish to attack Atlantis. The aliens are able to repel the attack, and Aquaman has the guppy call it off. Later, the guppy tells Aqualad how to get into Atlantis. Aqualad rides a swordfish into the city disguised in seaweed, and the swordfish cuts Aquaman out of his cell. Chapter Three: Aquaman and Aqualad ride porpoises as they follow the aliens to the surface. Octopi, including Topo, capture the alien guards when Aquaman distracts them. Octopi throw grenades, whales use their spouts to throw depth charges, and flying fish launch torpedoes at the alien ship. When those don't work, seagulls drop grenades on the ship. Electric eels attack the aliens in an underwater forest. A highlight of this one is a four-page recap of Aquaman's origin with a little more detail and focus on the Atlantis side than we'd seen before. This is important, because this is the first time in the Silver Age that Aquaman has entered Atlantis. He indicated in his origin in Adventure #260 that he knows where it is, and even attempted to return Aqualad to the city, but in this issue he finally enters for the first time, as a prisoner. This is a theme that will continue throughout his incarnations. When his origin is revamped in The Legend of Aquaman, his first contact with Atlantis is also as a prisoner. For Aquaman's first longer story we get just about everything an Aquaman fan might want. We get his origin again, with new artwork. We get Aqualad being responsible and on his own. We get Atlantis. We get a suitably nasty set of bad guys for Aquaman to defeat. We get a threat to the entire world that Aquaman has to deal with, not just to Atlantis. And lastly, we get a lot of awesome Aqua-exclamations. I'm particularly fond of "Sweet Seaweed!" At the very end of this story, we get a tagline that says, "Follow the Adventures of Aquaman in Adventure Comics". Aquaman will only have three more stories in Adventure Comics in the coming year, after which he won't return to that book until 1974.